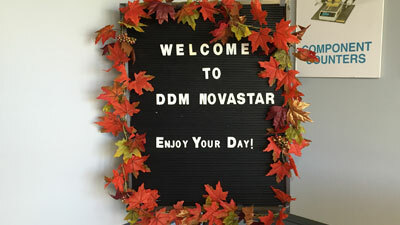 3rd Annual DDM Novastar Open House A Huge Success! September 28, 2015 (Philadelphia PA) - For the third consecutive year, DDM Novastar held its annual Technical Workshop and Open House on September 15-17, 2015 and was, by all measure, an enormous success. The Technical Workshop was attended by customers from Canada, Connecticut, New Jersey, New York, South Carolina, Virginia and as far away as Florida. Because the workshops have proven so worthwhile to customers, DDM Novastar has already scheduled their mid-winter workshop for February 9 & 10, 2016. Participants were able see all of DDM Novastar’s products first-hand in a single location, ask technical questions, meet the team that supports the equipment, and take a tour of the company’s exclusive U.S.A. manufacturing and assembly facility. And, as usual, some great barbeque from the local Rib House was enjoyed on the Thursday open house, which was attended by DDM family, customers, friends, partners and suppliers. If you’d like to pre-register for the Mid-Winter Workshop, contact Bernadette at +1 610-337-3050 x 206, or by email at BBiondi@ddmnovastar.com. DDM Novastar's products include stencil printers, automated pick and place robots, reflow ovens, wave and selective solder equipment, component counters and lead forming equipment. DDM Novastar's experienced team has installed over 24,000 product solutions in the telecom, defense and aerospace, security, transportation, automotive, medical and diagnostic devices, personal computers, and academic markets. For more information, visit https://www.ddmnovastar.com or call +1.610.337.3050.